Lin Heung Tea House (160-164 Wellington Street, Central) is one of the more popular and must-visit dimsum places in Hong Kong. 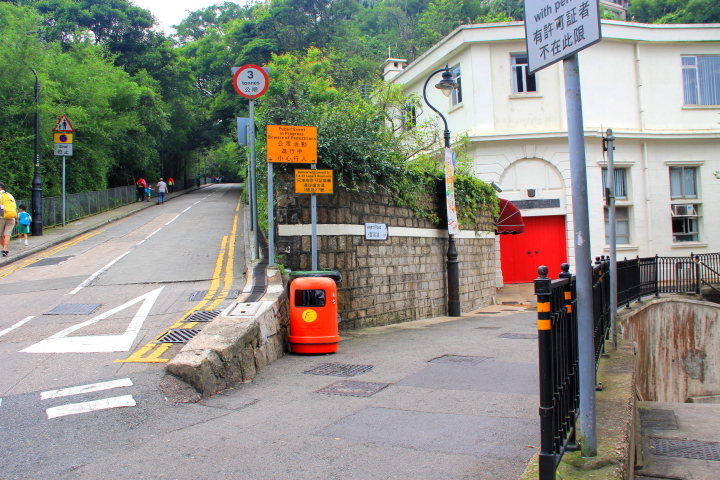 Fortunately for us, it is about 1.2 km away from our hotel at Best Western Harbour View , so we decided to walk instead of taking public transport. 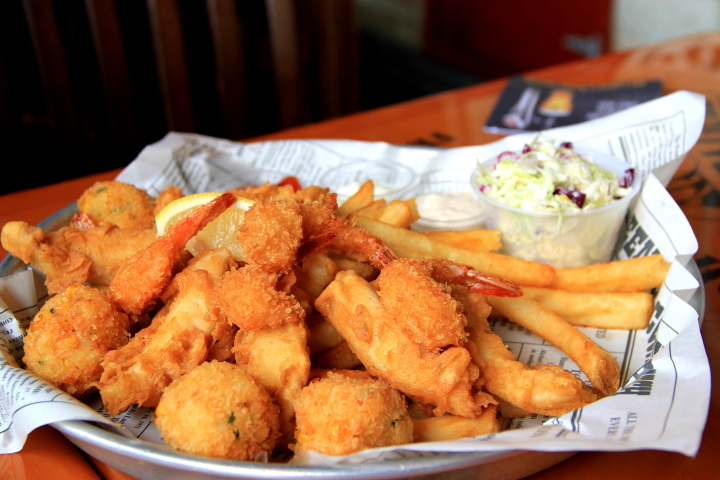 The restaurant is one of the oldest establishment in HK, it is always crowded. 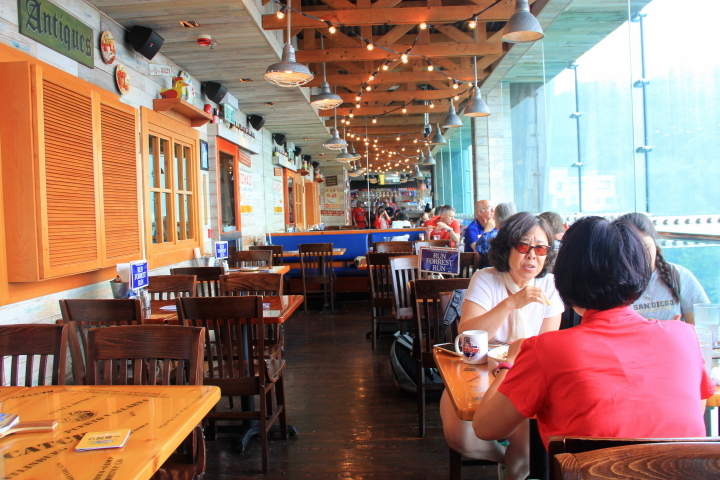 We waited to be seated, but the staff signaled to us to choose our own seat. So we chose one of the round table, which was a sharing table. The staff then served us tea, water for cleaning utensils, and gave us order paper. 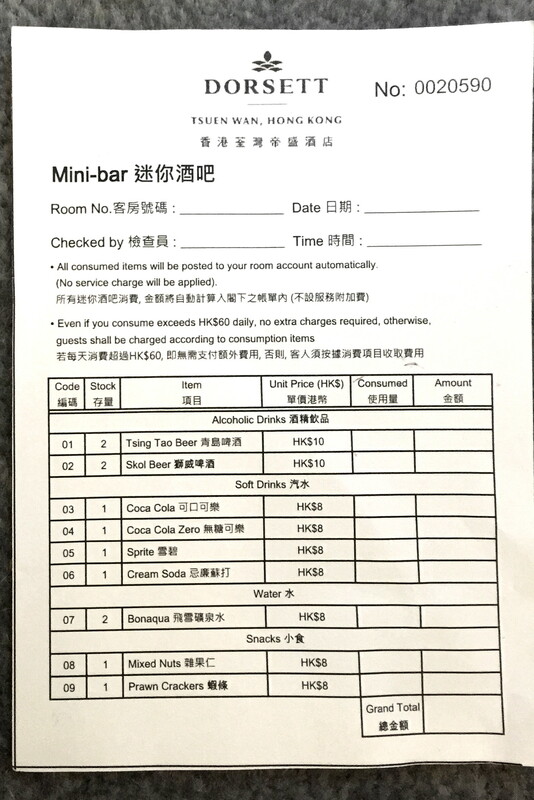 I have learned that in HK style dimsum restaurant, you must bring the order paper to the carts and choose your own dimsum. 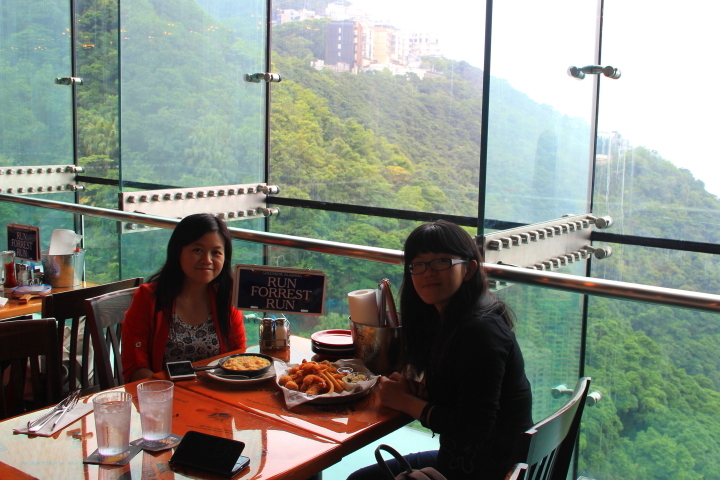 So even though I do not speak Cantonese, it was easy to get the food that I wanted. The downside for me was, I couldn’t my find my favorite dimsums, which are siew mai and har gao. I saw a waitress delivered these items directly to customers, not through the carts, perhaps I should have asked the waitress about it, but I didn’t. Instead, we settled for other dimsum items, such as fried dumpling and rice noodle roll. 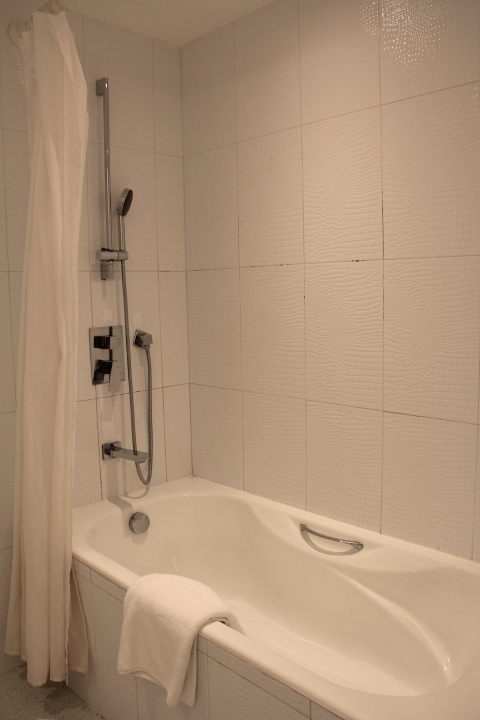 I felt that the price was quite expensive and I was not too satisfied with my experience. Our next destination was The Peak. My sister and I have both been there 6 years ago. 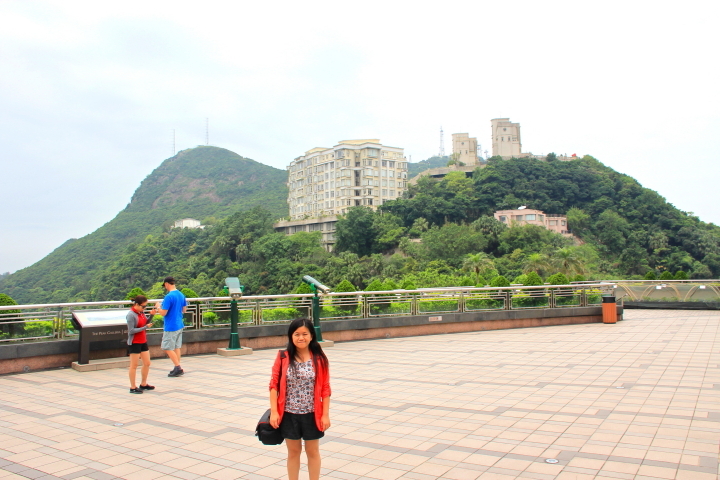 In June 2010, we went there with our parents, another sibling, aunt’s family, and cousins. 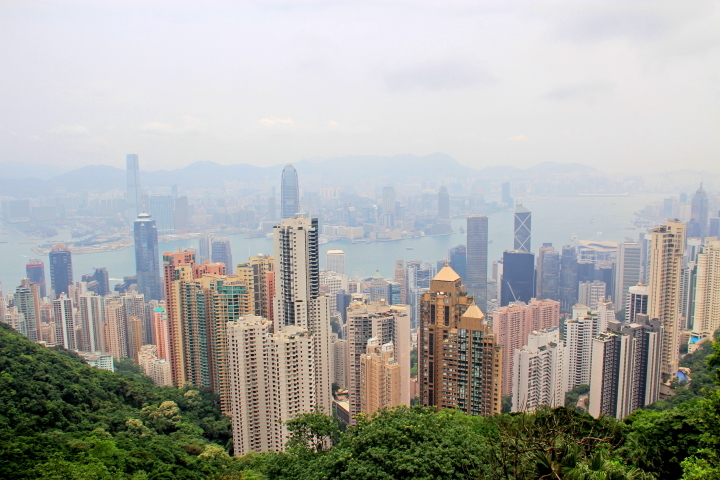 In the past, we took Peak Tram from Peak Tram Lower Terminus to The Peak Tower; then we visited The Sky Terrace 428 for amazing view of Hong Kong skyline. But this time, we wanted something different. 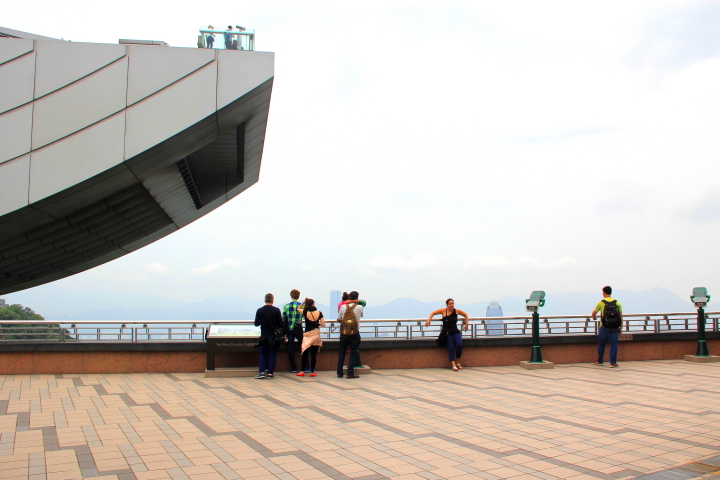 We didn’t want to take peak tram or visit sky terrace. I was so glad to find that it is possible to stray away from the mainstream. How did we do it? First, instead of peak tram, we took bus 15 from Exchange Square. 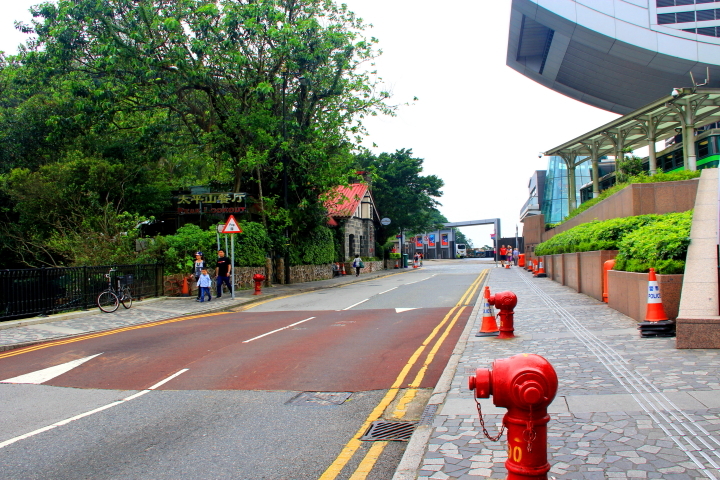 The bus stand might be hard to locate, it is actually at the same level with road, and it is inside the building. Hope the photo below helps. The bus fare from Exchange Square is $ 9.8. 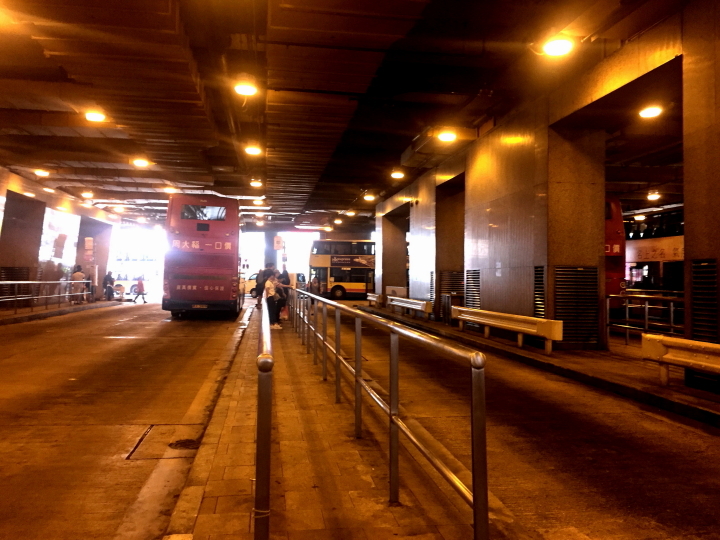 Do note that bus 15 starts from Central Ferry Piers and stops at many locations along the way (such as Exchange Square, Admiralty Station, and many more), so you can board this bus at any of the stops. This bus 15 brings you to The Peak itself. 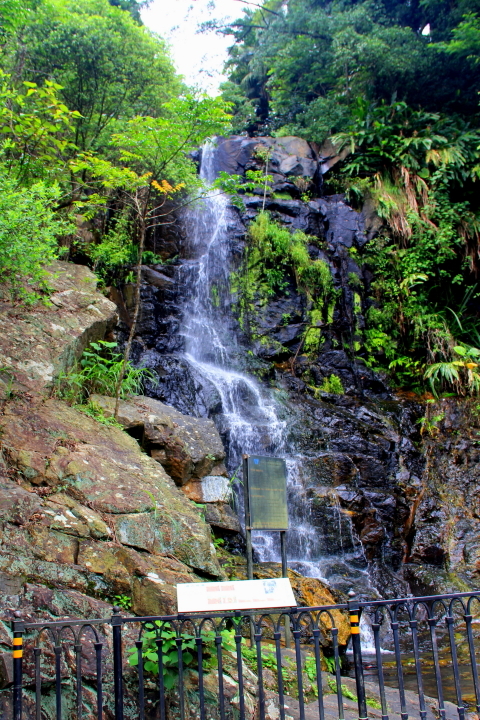 The whole journey was quite long, about 30-45 mins, but the scenery was enjoyable. Do not take bus 15C because it only brings you to Peak Tram Lower Terminus where you have to take Peak Tram to go to The Peak. 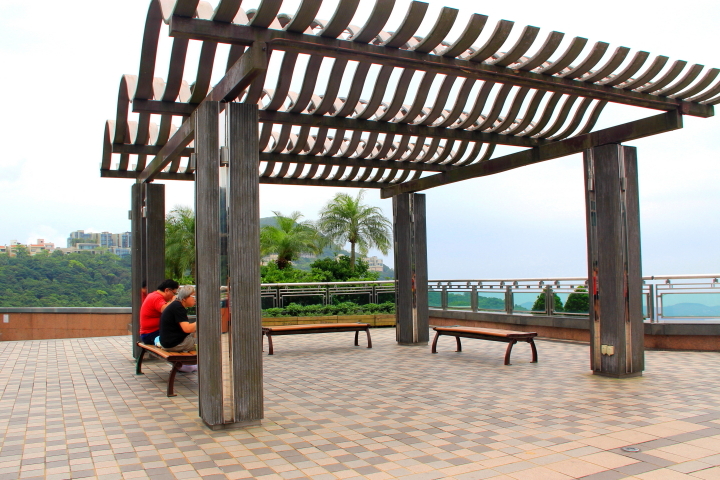 Second, instead of Sky Terrace, we went to the rooftop of The Peak Galleria, which was free of charge. We could view the skyline also. Despite some obstructions, the view was good enough for us. The breeze was good, we felt comfortable and didn’t want to leave. 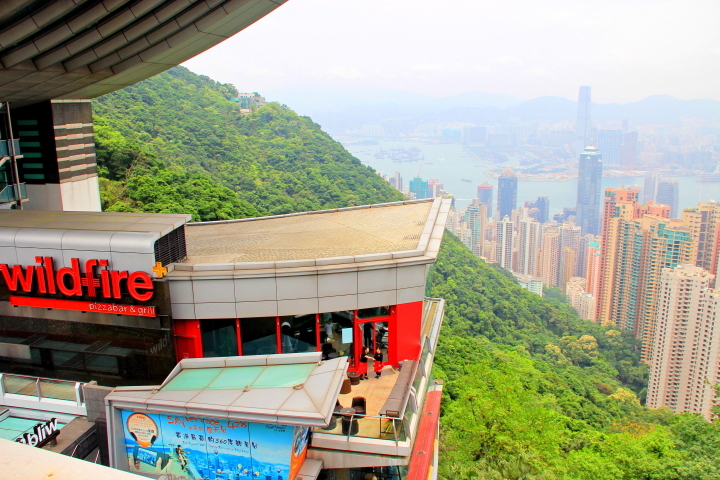 It doesn’t mean that Sky Terrace is not worth a visit, actually I highly recommend first-timers to visit Sky Terrace. We just wanted something different. 1. If you are a first-timer to The Peak, I suggest you to follow the recommended route: buy Peak Tram Sky Pass for $ 83, which allows you to board Peak Tram from Peak Tram Lower Terminus to The Peak Tower, and return to Lower Terminus. 2. 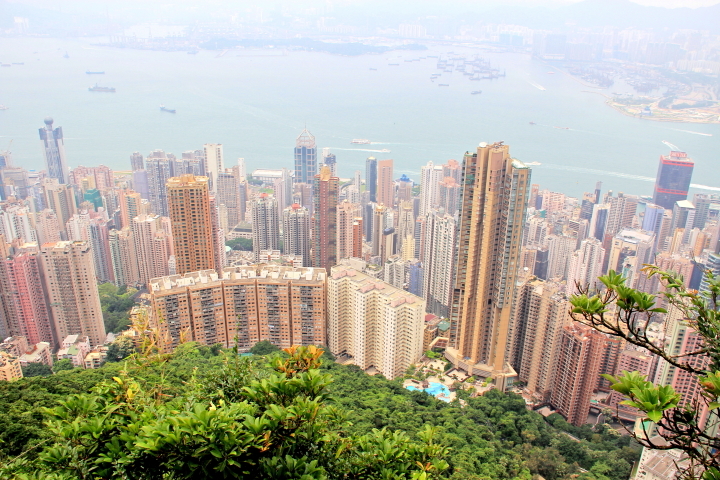 I do not recommend you to buy Peak tram & Sky Terrace ticket separately, because peak tram return ticket is already $ 40, and sky terrace ticket is $ 48. 3. 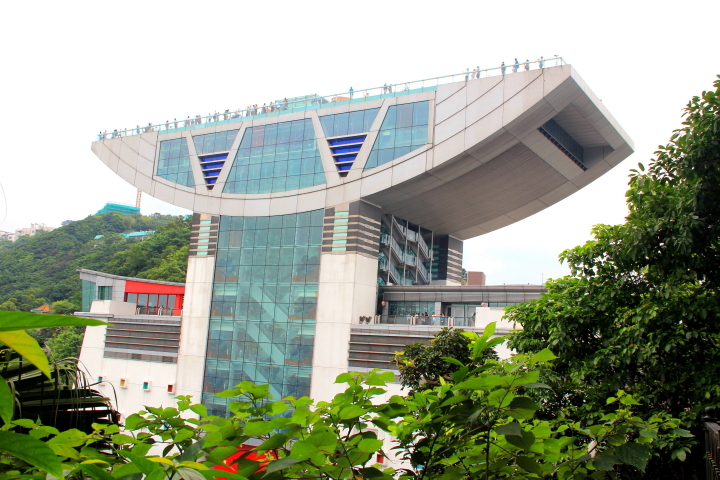 If you are planning to visit Sky Terrace, I do not recommend you to take bus because you don’t save much money but waste more time. 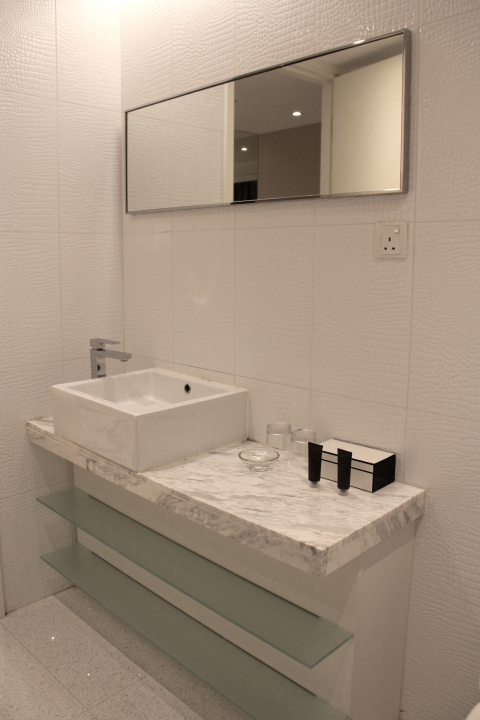 So if Sky Terrace is in your to-do list, follow my tips #1. 4. For details of Bus 15 route, cost and operating hour, check here. 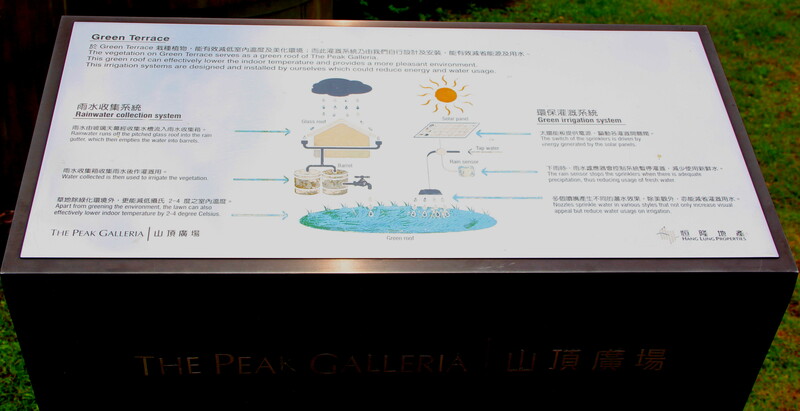 From The Peak Galleria, we walked to the starting point of “Peak Circle Walk”. 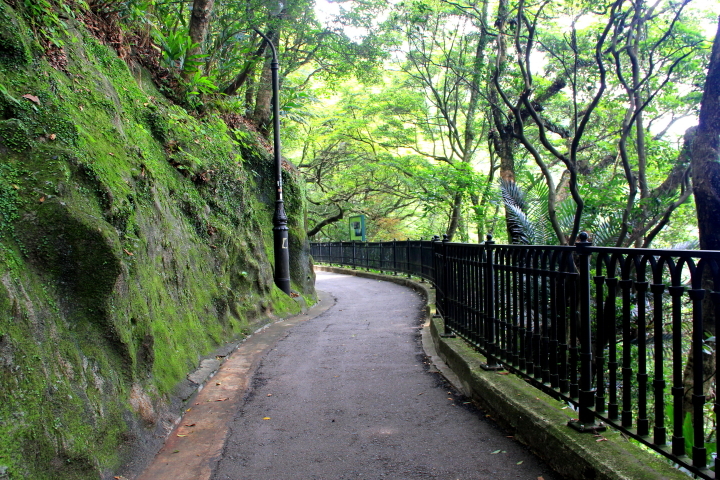 Peak Circle Walk starts at Lugard Road (see photo below), turns to Harlech Road, and ends at the starting point. It is a loop. 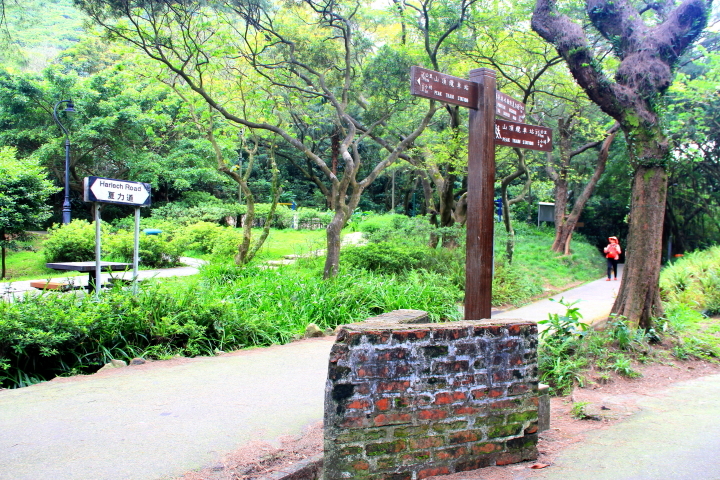 Peak Circle Walk is technically, part of Hong Kong Trail section 1. Peak Circle Walk is a pretty flat trail, doable in slippers. 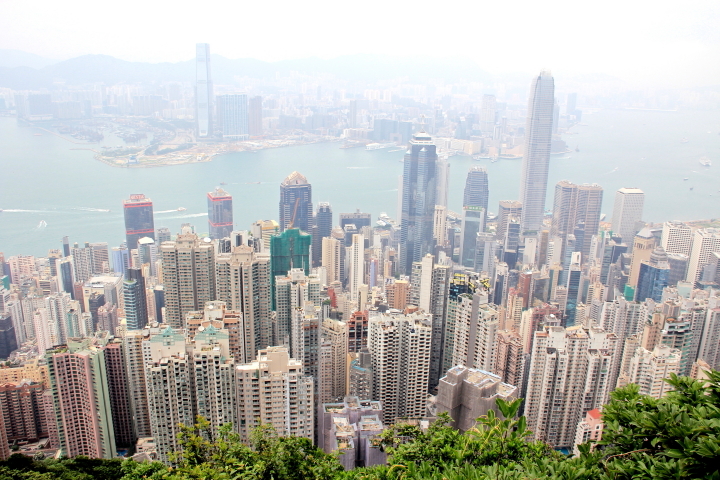 From the trail, you could get some sneak peek at HK skyline as well. 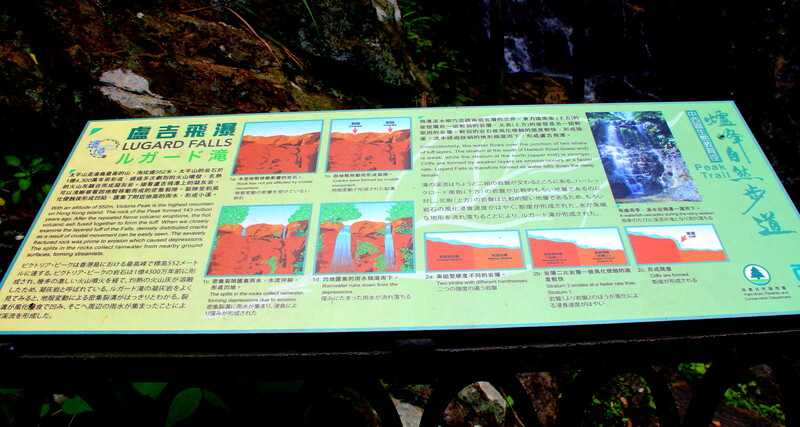 There were some small waterfalls. 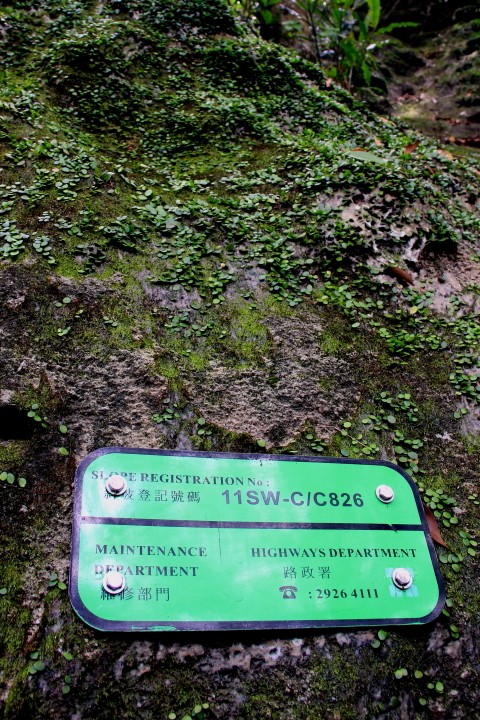 All of the hill slopes were registered, it is something that I found interesting. 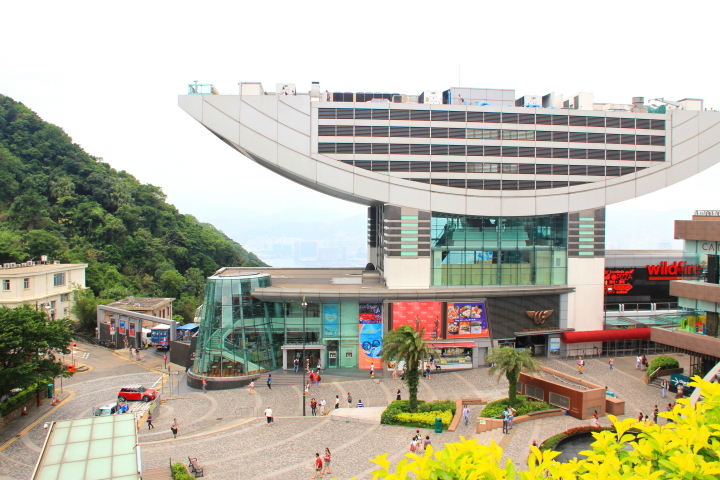 The Peak Tower and Sky Terrace, view from Peak Circle Walk. 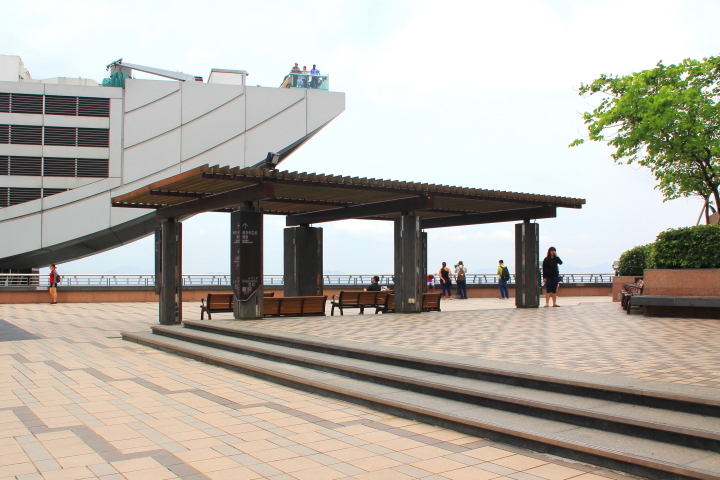 See those people on the sky terrace! 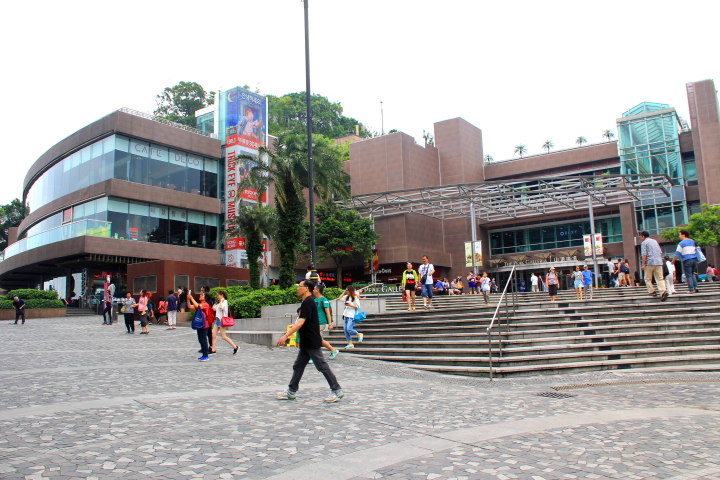 After some souvenir shopping at The Peak Tower, we took bus 15 back to Admiralty Station. 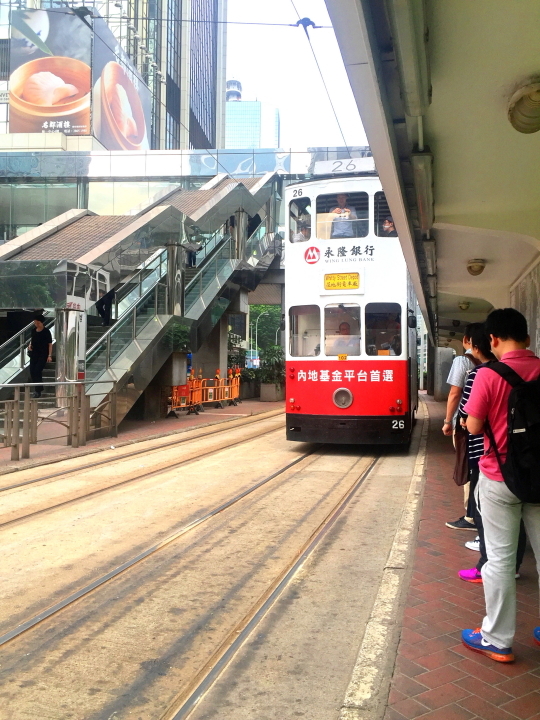 We just realized that from Admiralty Station, we can take tram (which is very cheap, only $ 2.3 flat) to go to our hotel. 1. 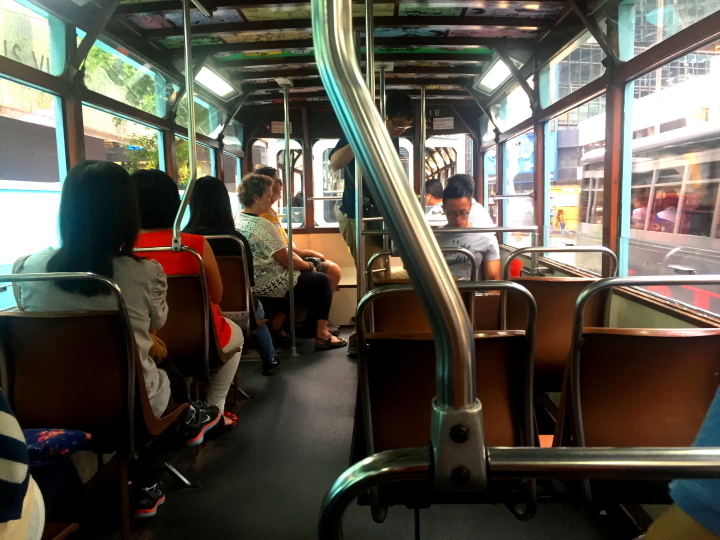 If you stay around / are exploring places in Hong Kong island which is served by Tram, I highly recommend you to use tram as your main transport. The reason: it is so cheap. 2. There are 6 main routes of trams, read here for more details. 3. The price is $ 2.3 flat to anywhere you want to go. 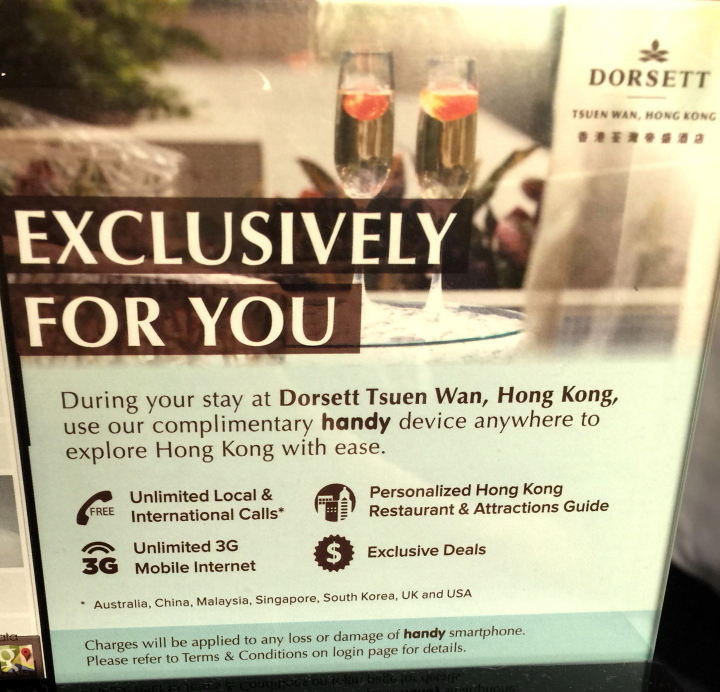 We collected our luggage from Best Western, carried our luggage and took MTR to Tai Wo Hau, then walked to our second hotel at Dorsett Tsuen Wan. 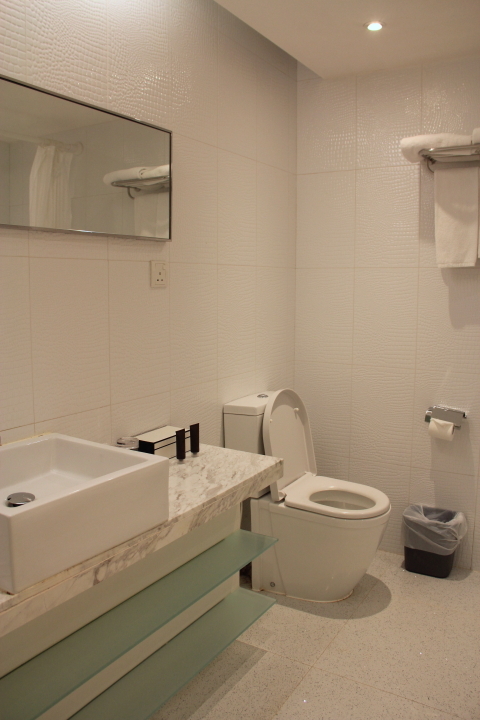 This hotel is not located at city center, and neither is it located beside MTR station. 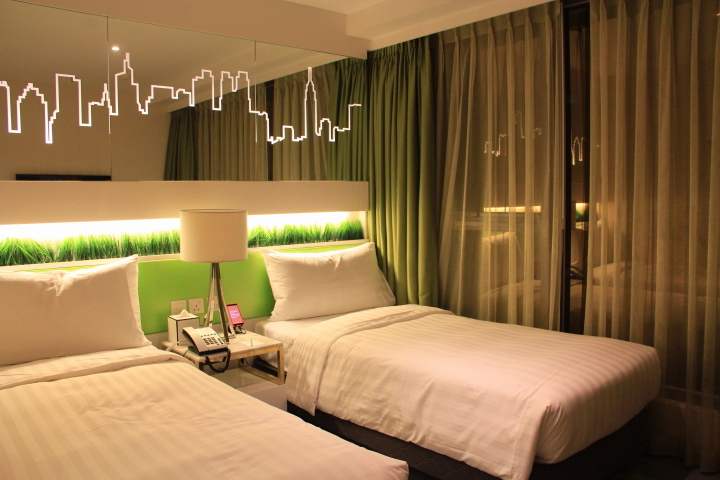 I booked this hotel because there were no more hotels in city center that fit my budget for the weekend I visited, even Best Western was quite full during that weekend. 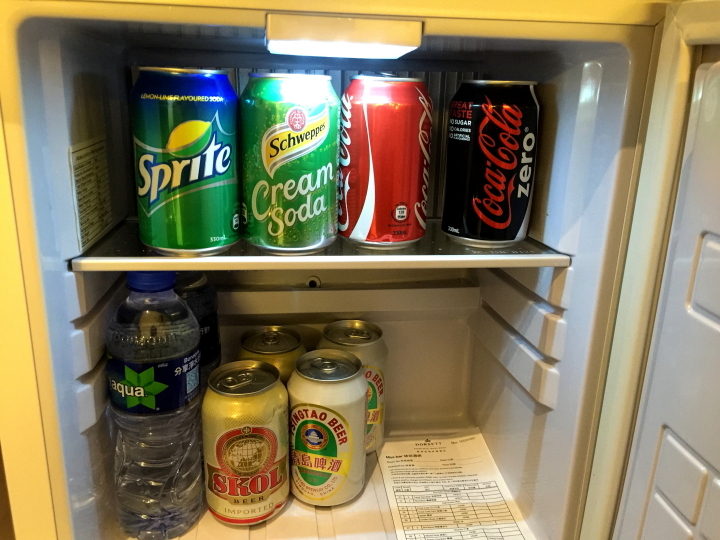 You know what, I like this hotel so much. 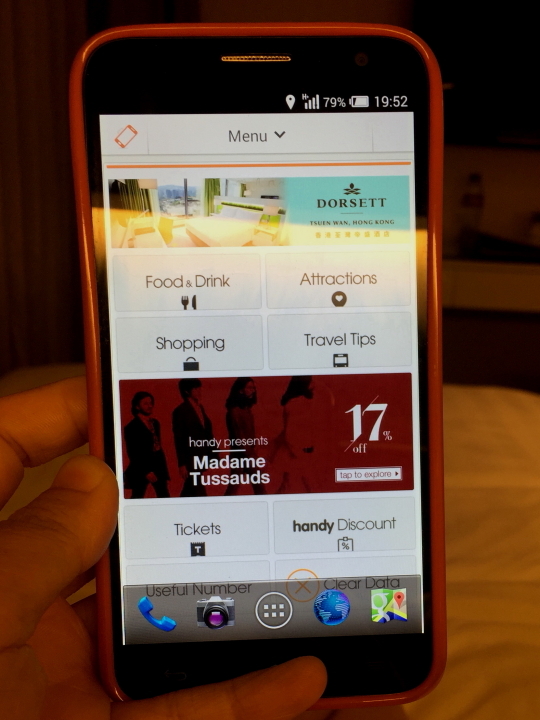 The hotel room is much bigger than Best Western, the interior is much nicer, there is a bath tub, and the best thing is they lent us smart phone for free. The phone can be used to access internet, made unlimited local calls, and international calls to 7 countries. How cool is that? 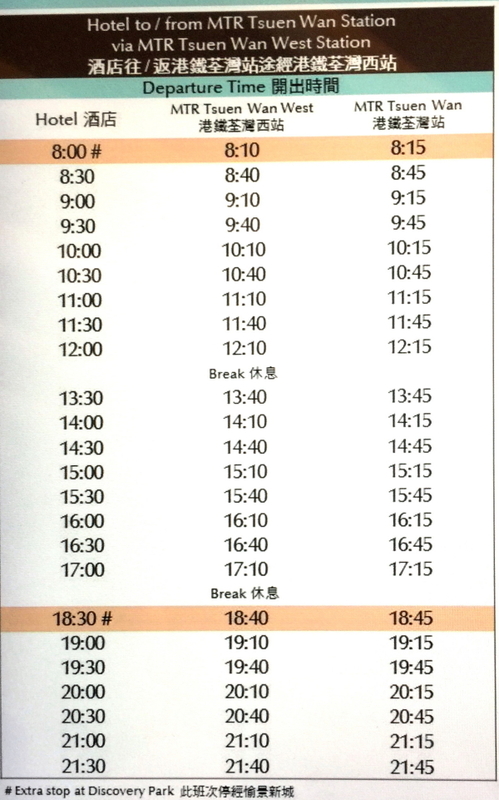 Another thing Dorsett provide is free shuttle bus to MTR Tsuen Wan Station or MTR Tsuen Wan West Station every 30 mins from morning until night, check their schedule below. 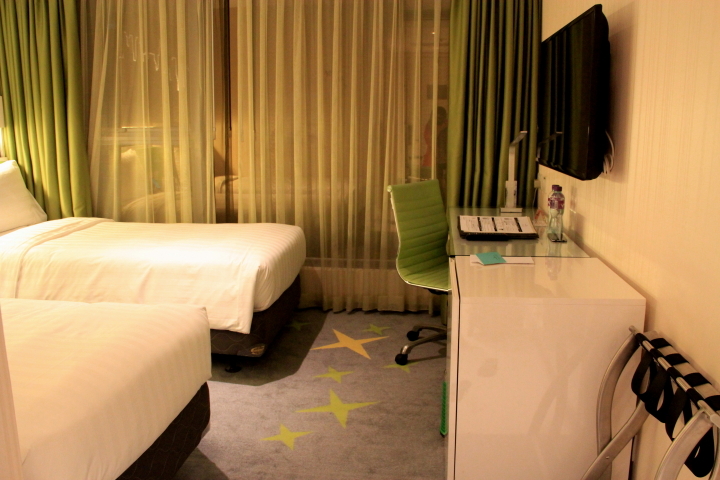 Once we settled down and unpack, we felt so comfortable that we didn’t want to go out anymore. So we had an early rest.